What have children been learning about during the Spring Term? Children in the nursery have continued to use their “This is Us” book to discuss what they have been doing outside of school and to share their family traditions. Children in reception have been learning about traditional nursery rhymes and have asked questions such as Who was Little Miss Muffet? and Why was Humpty Dumpty sitting on a wall? Max the Monkey continues his visits to children’s houses for the weekend. The children help him record his visit in his diary. The children look forward to sharing past events and talk about activities that they are involved in out of school. The children in reception have been celebrating families…. They have looked at different family dynamics – Who can be in a family? What is a family? Where could a family live? Where can families go on holiday? How big is a family? The children talked about living with extended families, living with mum, living with mum and dad, living with mum and mum, living with dad and dad living with grandparents and being part of an adopted family. They read a book all about families and looked at family trees and talked about what their family tree might look like. Children in Year 1 have been exploring houses and homes. They have investigated different periods in time and how the houses were different to those of today. The children plotted the different houses onto a time line from Stone Age to modern day. The children have been talking about objects that might have been found in a Victorian kitchen and living room and compared them to their kitchens and living rooms at home. Year two have been learning about life at the time of the Queen’s Coronation in 1953 and have discussed the objects that were used during the ceremony. As part of this they have been learning about how the food we eat and shopping has changed. We are finding out about seasonal eating, rationing and…shock horror…how McDonalds was not yet available! As part of this we have looked at a suggested menu from a magazine in 1953 and chosen our favourite meals. Soon we will be cooking some of our favourite. Hands up for jam roly-poly and spam fritters! Children in Year 3 have been finding out about Ancient Greece. They have looked closely at Greek pots and compared and contrasted designs. …..and then made their own pots. Year 4 children have been learning about the Normans and the Norman Conquest. They have researched the function of castles and where they were situated on the north east coast. They created fact files on William the Conqueror. They also worked together to create a time line of Norman events. The children in Year 5 have used their History topic of Egyptians as a stimulus for exploring the nets of shapes and have created pyramids and the Sphinx. They watched a programme about the Great Sphinx of Giza which used laser scanning to find out who the statue was built for and then made Sphinx models made from a net. Children in Year 6 have continued to explore the voyages of Captain Cook. They have looked closely at his historical significance and his impact on modern life. They enjoyed writing diary entries as though they were Captain Cook and then wrote information posters about him. Eduardo Galeano once said, “History never really says goodbye. History says, “See you later.” The children at Pittington Primary School explore aspects of History which will help prepare them for the future as well as developing knowledge and skills which will help support their mathematics and literacy skills. What have children been learning about during the Autumn Term? Children in the Early Years enjoy listening to stories about the past and are encouraged to ask questions such as how and why? They are encouraged to talk about the past, the present and the future in their own lives and the lives on their families. They learn about traditions within families and the similiarities and differences between families. Role play and made up stories are great opportunities for children children to explore the past. Children in the reception class have been comparing and contrasting gardens from the Victorian period with gardens from the present day. They discussed the similarities and differences between the gardens and voted for the one they preferred. They looked at lots of artefacts to learn about Remembrance Day. They looked at medals, a special Penny and even held a ceramic Poppy that had been on display at the Tower of London. Children in Key Stage 1 have been developing their awareness of the past using common words and phrases relating to the passing of time. 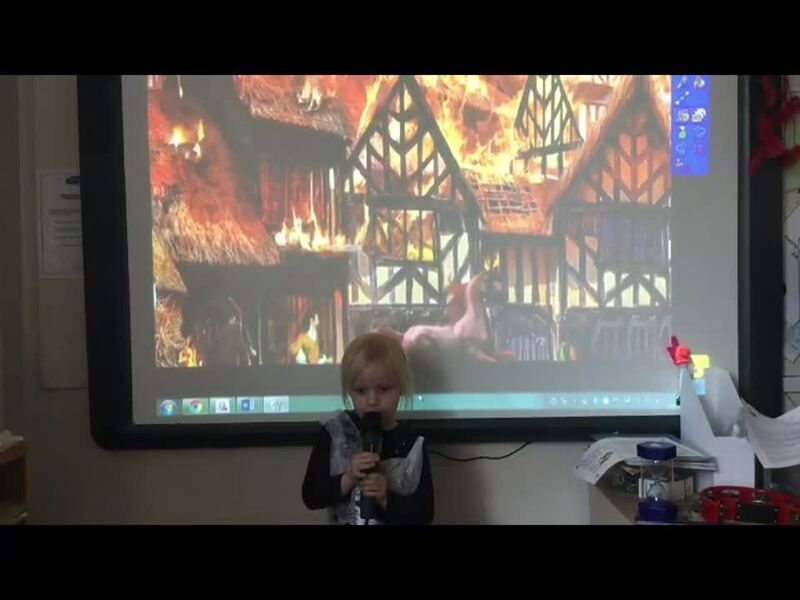 They have been finding out about the Great Fire of London: how the fire started and why it spread so quickly. In fact they have become experts on the subject and have used their presenting skills to make a television report. The children enjoyed writing to King Charles to give him some good advice as to how to stop the fire. They wrote using quills (pencils with feathers attached) on charred paper – because it was obviously burned by the flames. They wrote their letters by candle light, just like Samuel Pepys had written his diary during this period. It was a writing environment reminiscent of 1666. The children then designed Tudor houses from the historical period and once the London street was created – we invited Durham Fire Brigade to visit school to burn the houses down! It certainly showed the children how quickly fire can spread. The Fire Officers kindly let the children take turns with the hose to squirt the water onto the burning houses. Great fun was had by all! Year 1 also enjoyed designing and making poppies as part of Remembrance Day activities.. This activity was organised and set up by Harry, one of the children in Year 1. He wanted to set up a Poppy Club and his friends all enjoyed taking part. Year 2 and Mr Shackler, the Caretaker were most surprised to find what looked like dinosaur bones and dinosaur eggs on the school field. They investigated further and decided to write to an archeologist to ask for further information. An important skill in historical enquiry is using artefacts to gather ‘clues’ about the past where there is no written record. Year 2 used this portrait of Mary Anning to discover more about who she might be and what she might be famous for. Year 3 have been exploring ‘Who first lived in Britain?’ They have explored the similarities and differences across the three periods of Stone, Iron and Bronze Age focussing on hunter gatherers and farming. Year 4 have been exploring Romans and have enjoyed a trip to Arbeia Roman Fort. Year 5 have been looking at the life and times of Oliver Cromwell. They have recently visited Sunderland Empire to watch the Horrible Histories production of Awful Egyptians – the history of Egypt with all the nasty bits left in! This is in preparation for their History work in the Spring term. Year 6 have been discussing exploration through time with a focus on the Vikings. They have learned about the voyages of Christopher Columbus and his motives to explore. They are now focussing on how technological advances will enable further exploration including the exploration of space. The whole school respected the two minutes silence for Remembrance Day. 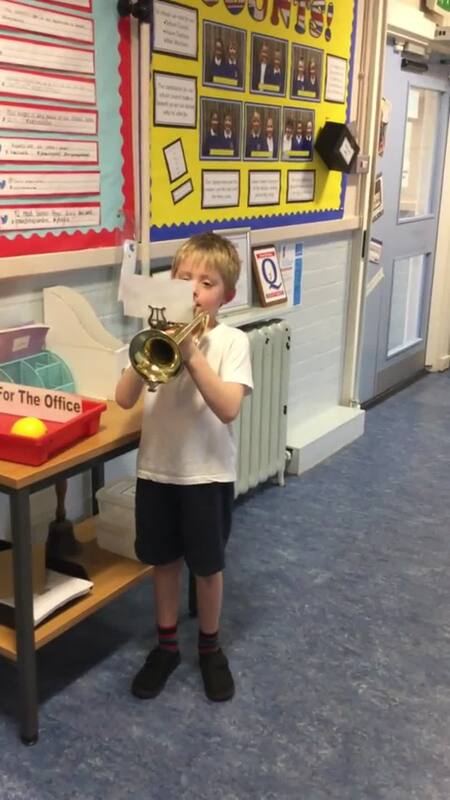 The bell sounded for the start of the silence and it was ended by Alex playing The Last Post on his cornet. It was a very memorable moment.